We’ve been in Sausalito four nights. We had intended to leave this morning but a revised weather report indicated a “mixed swell”. Oh, dear! A “mixed swell” implies dual waves coming from two directions, in this case both the south and the west, simultaneously. These waves were predicted to be 6–8 feet in height and to arrive at 12 second intervals. In addition, the wind was predicted to blow 5 – 15 knots from the north. Singly, one of these conditions would be fine but the combination of the three didn’t sound pleasant. We talked it over and decided to stay another day. After another long run/walk around lovely Sausalito, we topped off the water tanks and ran the vacuum cleaner using the marina’s AC power. We returned to the anchorage that served us well our first night in the bay. Many years ago, we installed a WiFi booster antenna guaranteed to pick up WiFi for several miles in every direction. When we left Portland we found we were having trouble with the Bad Boy and consulted the distributor, Bit Storm, who indicated there had been an upgrade and due to our new laptop we would need to install new software. Bit Storm promptly e-mailed the executable files and installation instructions. There hadn’t been much need for it while we were out in the ocean. When we checked into the marina in Sausalito, their WiFi was abysmal. I was unable to download a photo or do a Google search. Peter spent two hours installing and configuring the updated Bad Boy software and like a miracle our WiFi access was phenomenal. Thank you, Peter. 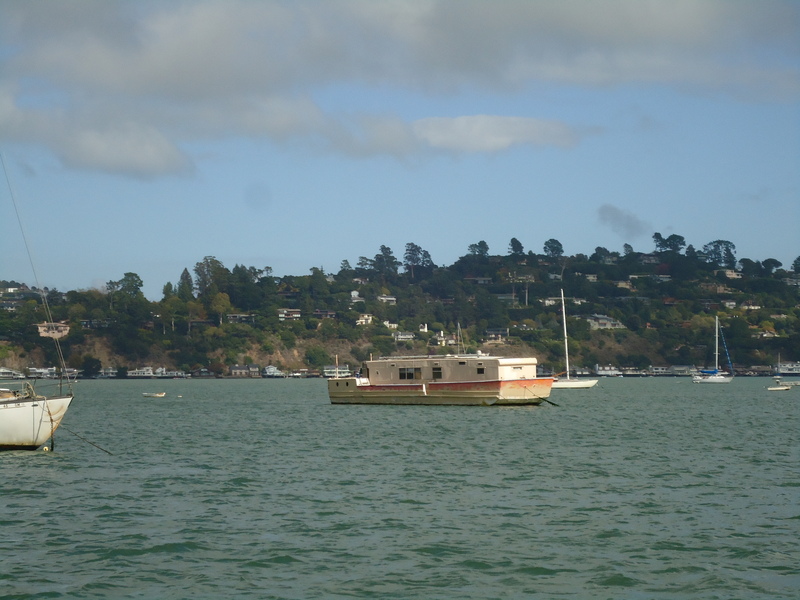 Here at our delightful little anchorage off the shore of Sausalito we are able to access dozens of sites. But, out in the ocean, of course, all bets are off . . . I snapped this picture of an unusual yacht configuration. Tomorrow at 0900 we will cross the San Fransisco bar and head out to the Pacific Ocean once again. The forecast is for southwest winds, 5-15 knots. Perfect. Our intended heading is south. Next stop: San Simeon, California, home of the famous Hearst Castle.